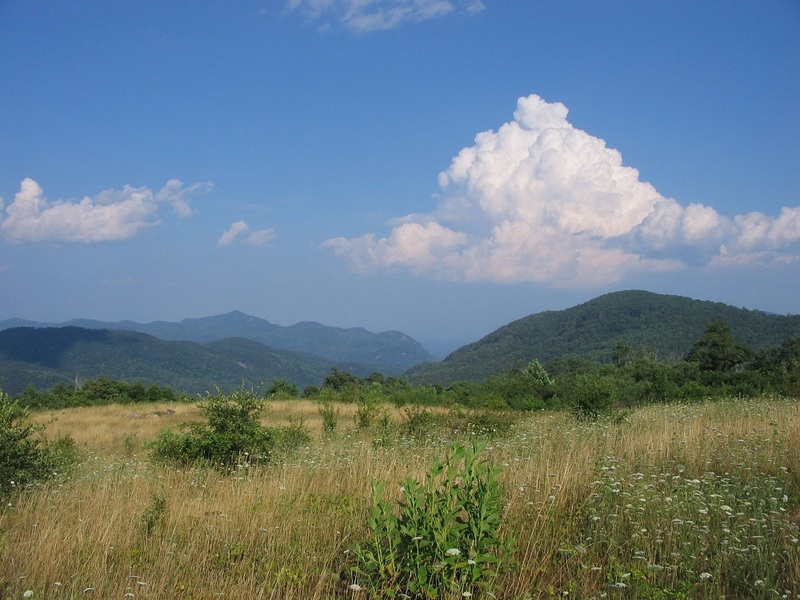 Trombatore Trail is a 2.4 mile (each way) trail that leads to Blue Ridge Pastures, a grassy bald with spectacular views. The trail offers a vigorous hike with considerable up-and-down elevation change, through a forest with clear mountain streams. When you reach Blue Ridge Pastures, you will be rewarded with panoramic views of the Hickory Nut Gorge and Bearwallow Mountain. The trailhead is on Bearwallow Road, near Fairview, NC. It is directly across the road from the Bearwallow Mountain trailhead. The Trombatore Trail starts at the same parking area as Bearwallow Mountain Trail, at the top of a steep hill on Bearwallow Mountain Road. Park on the graveled area on the shoulder of the road. Since there is only room for a few cars at this trailhead, consider carpooling. Please respect the adjacent property owner by not blocking the gate, road, or driveway across from the parking area or using it to turn around. 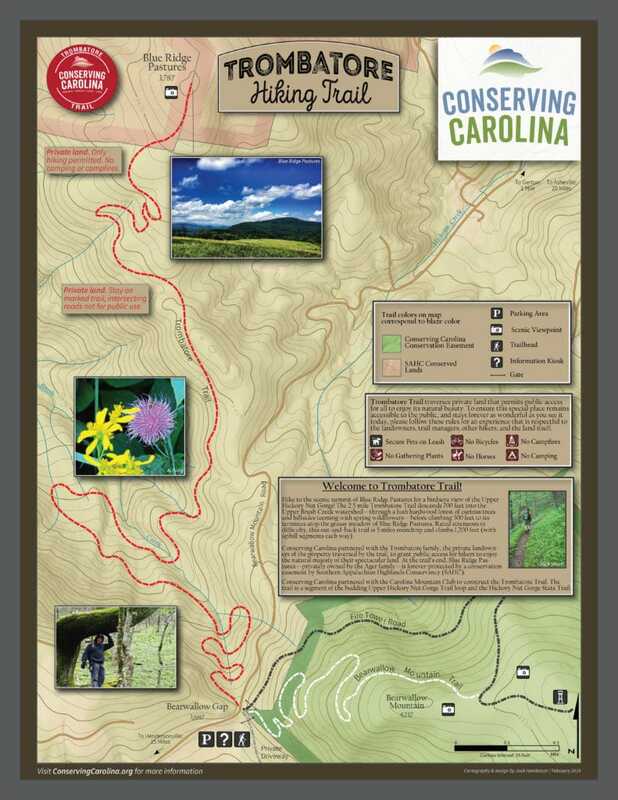 Conserving Carolina is planning to expand and improve this trailhead in the future. The trail begins on the same side of the road as the gravel parking area, opposite the Bearwallow Mountain trailhead. The Trombatore Trail begins at the Bearwallow Gap trailhead, on the opposite side of the road as the Bearwallow Mountain trailhead. You will pass through the Upper Brush Creek watershed on your way to the exceptionally scenic Blue Ridge Pastures. After passing the trailhead kiosk, hike down toward Upper Brush Creek via a series of switchbacks. After about a half mile, you can see a picturesque tree with a uniquely curved trunk. Only 100 yards past that, the trail passes another interesting tree. Look below you to the right to spot a giant buckeye that is the largest tree on the entire property. Its many burls may be the reason that loggers who once timbered the tract chose to leave it standing. The tree now stands more than 100 feet tall and is likely more than 150 years in age. At 1.1 miles, the single-track trail junctions with a grassy road. Turn right and follow the road uphill, following signs at several more junctions until trail resumes as a single-track path, 1.8 miles in. Another uphill climb will take you to the grassy meadow of Blue Ridge Pastures at 2.4 miles. Turn left and walk to the summit to enjoy panoramic views of the Hickory Nut Gorge, including Bearwallow Mountain, Florence Nature Preserve, Little Pisgah Mountain, and Wildcat Rock. On a clear day, you can see Mt. Mitchell and the Black Mountains to the north. This is the end-point of the trail. To return to the parking area, hike back the way you came. Because this hike to Blue Ridge Pastures involves both a descent and an ascent, keep in mind that the return trip to the trailhead is also strenuous. 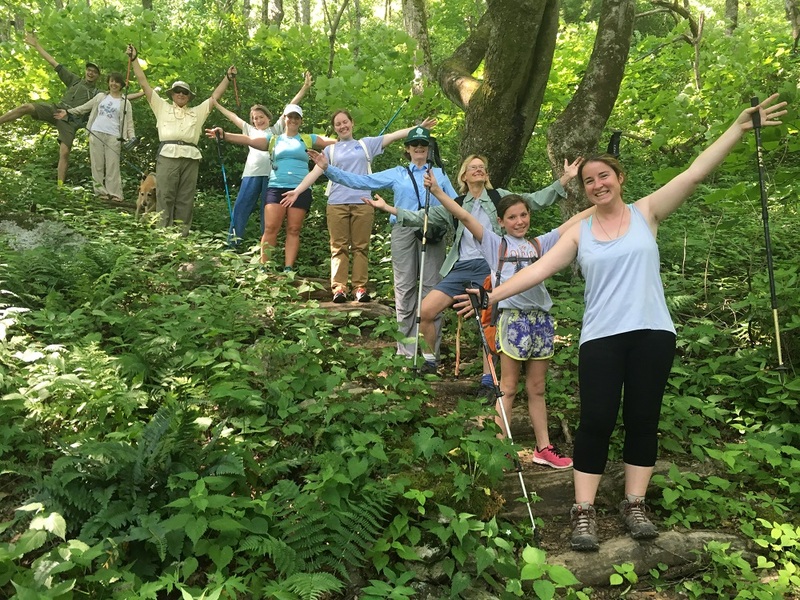 The out-and-back hike is nearly 5 miles with more than 1,000 feet of cumulative elevation gain—with much of that on the way back! 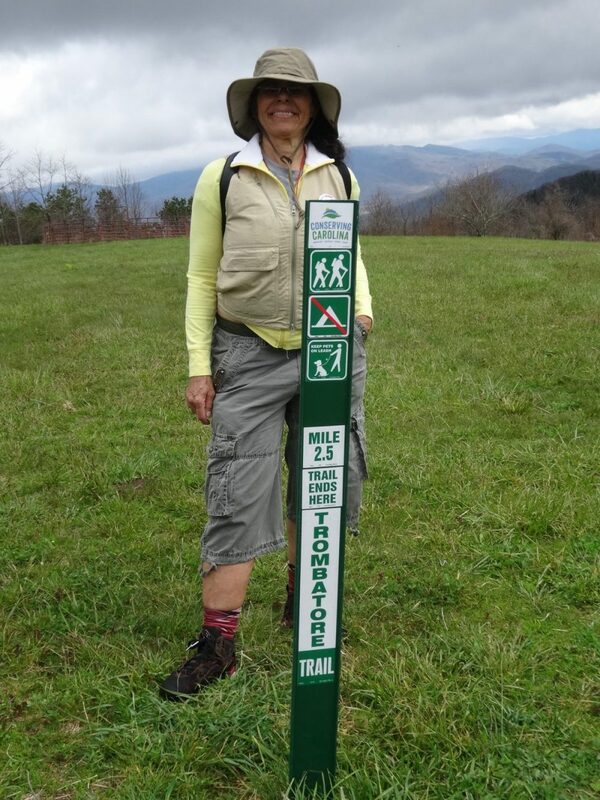 Trombatore Trail takes you to Blue Ridge Pastures, where you can take in amazing views of the Hickory Nut Gorge. The Trombatore Trail is named for the Trombatore family, who generously donated a public trail easement across their land. While this is private land, they made it open to the public to share the natural wonders of their property. The Trombatore Trail was designed and constructed by Conserving Carolina with the help of volunteers with the Carolina Mountain Club, NC BRIDGE Crew, and REI Asheville. It was completed in 2013. 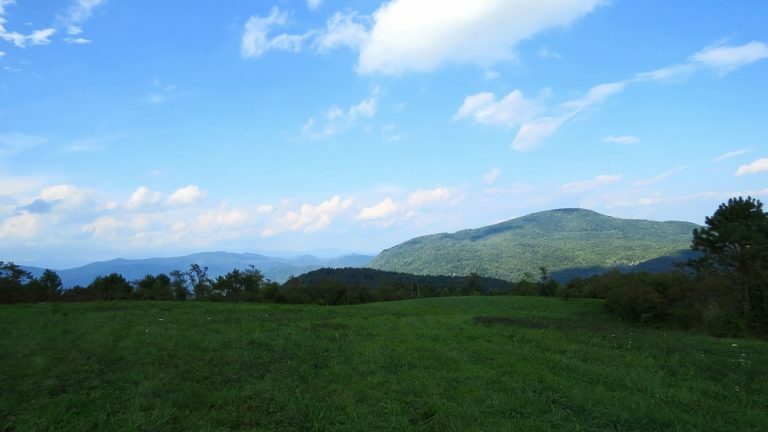 Blue Ridge Pastures is protected by a conservation easement held by Southern Appalachian Highlands Conservancy. It is also on private land that is open to the public for hiking. In partnership with Southern Appalachian Highlands Conservancy, Conserving Carolina plans to extend the hiking opportunities from the end of the Trombatore Trail with the future Blue Ridge Pastures Trail, which will continue three miles to Hickory Nut Gap on Highway 74A. Construction of this trail is planned to begin in 2019. Our vision is to eventually create a 20 mile loop trail in the Upper Hickory Nut Gorge as part of the emerging 100+ mile Hickory Nut Gorge State Trail network. Please keep in mind that these trails cross private land, which the landowners have generously opened to the public. Please show respect for the landowners, your fellow hikers, and the natural community. If you enjoy natural places like the Trombatore Trail, please consider making a gift to Conserving Carolina. Your support helps us protect more great places and build more trails so we can all get out and enjoy the mountains! Trombatore connects to more awesome trails. And there are many more places where you can get outside to hike, picnic, paddle, mountain bike, walk your dogs—whatever you love to do in nature!